Hi, I'm Beth a qualified and experienced early years educator with over 20yrs experience. I'm a mum of four two in high school and 2 in Primary. I am currently working as a part-time Juggle Street Nanny but I'm looking for a few more hours work. I'm looking for something that I can do that I love, and that I can take my 4yr old along with me occasionally when he's not in Kindy. He is a gentle, loving boy and my youngest of four. 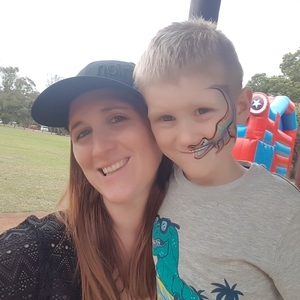 Being a mum I know what a huge deal it is to find the right person to come and care for your precious children, I would feel honoured if I got the chance to meet you and your family. I'm happy to meet for coffee/playdate. I'm keen to help you find the right work/home/leisure balance for you and your family and enable you to have "me time" or "date nights" as I understand how important this is for a healthy family too. I love all ages, each stage excites me whether it's newborns, the terrific 2s, primary age or teens, every age and stage has something amazing within. I'm experienced with all ages although just qualified with early years 0-7yrs. I was a long-term live-out Nanny for 3 families, 2 for 5yrs and another for 2 years, these are special memories and taught me how valuable and beneficial the right nanny can be in a busy home. I have also had about 8 years experience working in childcare centres 2 of which I held senior roles. In 2017 along with my husband I worked as a Kids Pastor overseeing 4 large churches within Perth, providing quality programs for 1-12yr olds on Sundays, midweek meetings and various other events including conferences caring for over 300 kids with my team of volunteers. I'm Fun, trustworthy, reliable and a responsible mature nanny. "Beth is fantastic. A beautiful personality and a wonderful rapport with our girls. Nothing is too much trouble- she goes above and beyond and is an absolute delight to have in our home. " "Beth and our daughter immediately hit it off and we would be happy to recommend her to anyone. Our little family is very glad to have found you Beth. "